When we first started our farm, our minds were alive with the possibility of the different animals that we could host here. Amateur chicken keepers already, we knew that having laying hens was a must. Our farm has hosted a few different animals in its short lifespan already. Chickens will always be a staple here at Under A Tin Roof. We currently have 21 laying hens and 3 roosters (Arlis, Indigo, and Gaston). 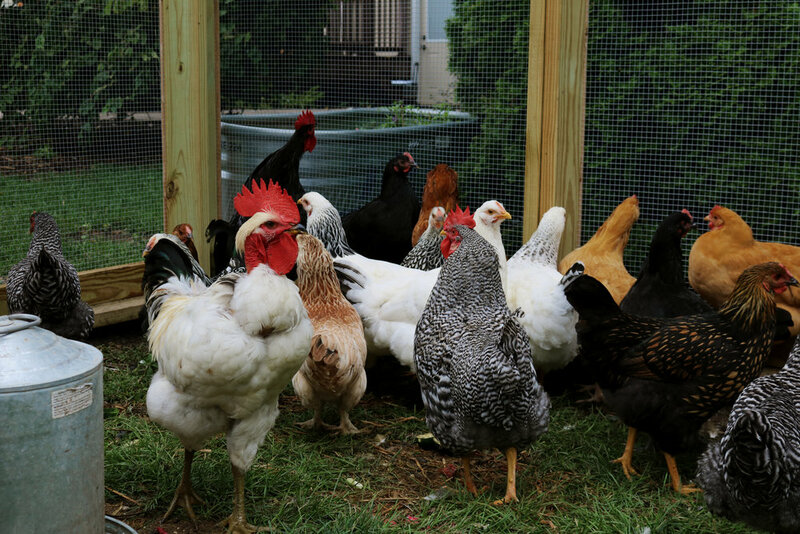 They live here at the farm in their own coop with an enclosure that allows them to access the outdoors. This enclosure is mostly used for days where we are traveling or to protect from predators as our flock free ranges the farm 99% of the time! We release them to the fields at sunrise and lock them up safely in their coop at dusk. This allows our birds to spend their time as they like, able to dine on bugs, grubs, and dirt as they please. There are so many reasons! For us it feels right, ethically, to allow our birds to roam free on the property. It also results in the highest quality egg you can find. The yolks are a deep orange-yellow color that you simply cannot get from a factory farm hen. 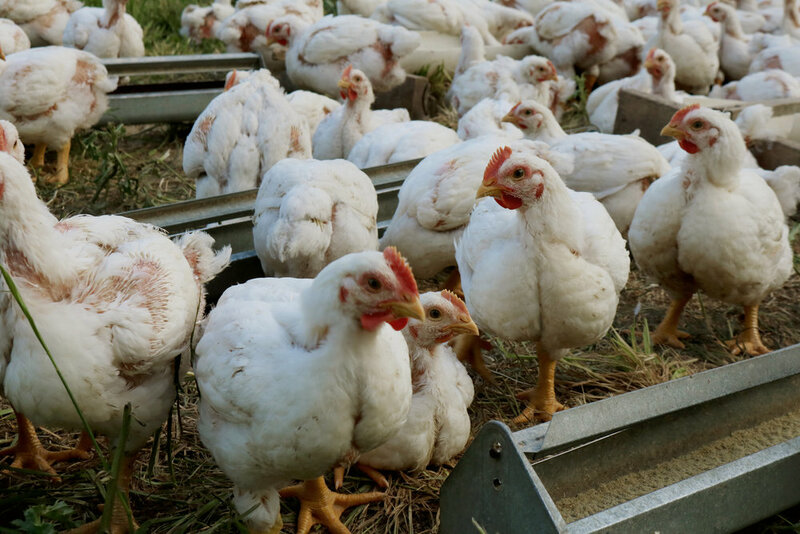 Because our flock is small, we believe that you are still getting the high quality product from a "backyard chicken" here just like you would if you kept them yourself. We started our first flock of chickens in the spring of 2016. There were only six ladies then! Muriel was the name of one of our Barred Rocks; she was beloved by our family and our readers as well. When we sold the Little Homestead and moved to the farm, Muriel stayed behind with the new owners. We knew that Muriel had to live again here at Under A Tin Roof Farm! Though she may be a different chicken, Muriel is still here and will always be a name within our flock. 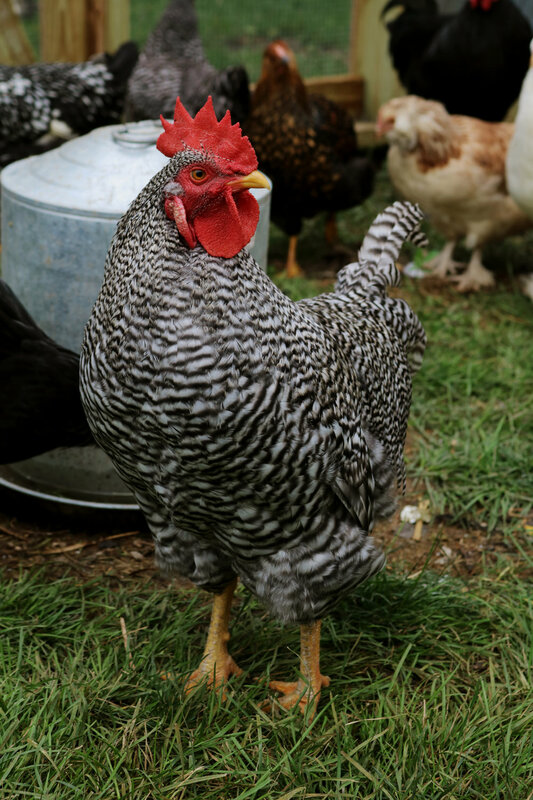 All of our other chickens have names as well, but you'd have to ask us what they are when you visit! We do sell the eggs our chickens produce. If you would like to purchase eggs, please visit our General Store or come see us at the Farmer's Market! We hope to possibly sell newly hatched chicks in the spring of 2019. Please subscribe to our newsletter or keep watch on social media for any upcoming information. Our kittens are definitely a huge part of the personality of our farm! Friendly, cuddly, and cute they bring joy to just about everyone who stops by. Our cats and kittens do not being given a scratch behind the ear, but we ask that you keep in mind animals are unpredictable and might scratch you! Some of the cats at Under A Tin Roof Farm have a unique genetic condition called "Odd-Eyes" or complete heterochromia. When this happens, the cats have two different colored eyes, often one blue and the other is either green or amber. This generally happens only in purely white cats! While many believe this condition causes deafness, it is a common misconception. Only about 10-20% of odd-eyed cats are born deaf and the chances generally decrease if they have markings of color on their fur. Interesting! 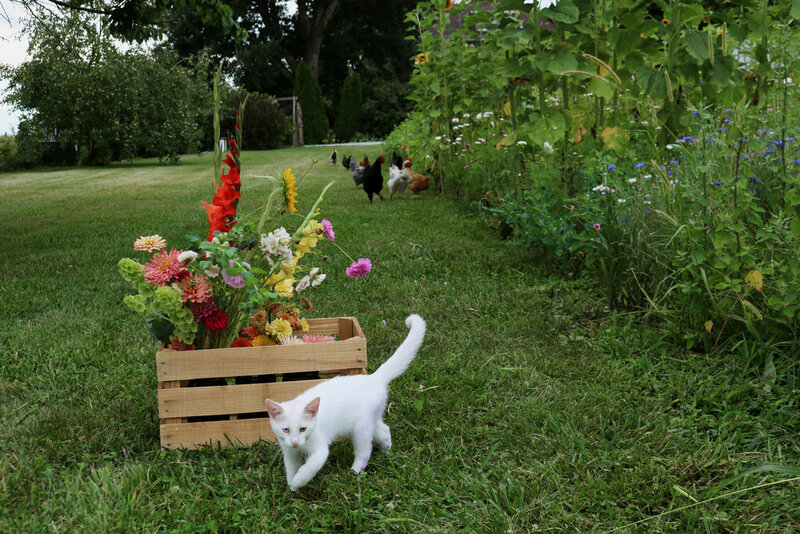 If you happen to make a trip out to Under A Tin Roof Farm, you'll be sure to be visited by one of our kitties! You may have noticed after perusing our website, CSA program, or by visiting our farm that we offer pastured meats when in season like chicken, pork, and turkey. These meats are not raised directly on our farm, but by our friends and business partners Wild Farm. Their meat is raised right out on pasture is GAP certified. It is hormone and antibiotic free. You can read more about their meats by clicking the button below!